I love the taste! Was quite worry that it will taste artificial but it's actually not. It's lovely mango taste, sweet and thick enough to make you full. Great job Foodspring on this one! I purchased the shape shake with the hope that it would be a dessert for me after dinner. I tried the Cocos Crisp shape shake powder with milk, but I really do not like the flavor. Somehow it tastes very artificial. Maybe the other flavors are better. However, it is effective at keeping me feeling full, and suppressing my cravings in the evenings. Disappointed by the taste of this product. I will obliged myself to end it and will switch for the vanilla version ! Best taste ever, will never go back to other, nasty tasting diet shakes! Super excited to try coconut! The shake is great. hopefully can loose some weight, will see. Tastes good. Think about a free measuring spoon for following orders. Would be great. I love this shake because the taste reminds me of summer. Shape shake is really helpful. so good to get and stay in shape. can also say that it motivated me soehow, maybe cause of the good taste. 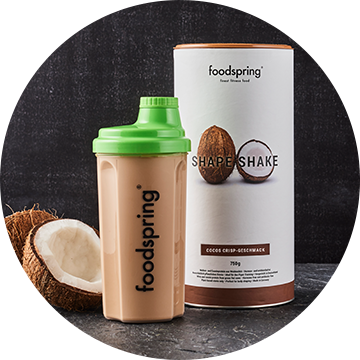 Shape Shake will be back in stock shortly.